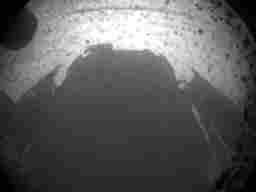 Mars Rover Pulls Off High-Wire Landing : The Two-Way The rolling NASA laboratory called Curiosity kicked off what's expected to be a two-year mission on the Red Planet with a tricky automated landing in a Martian crater. An artist's rendering shows a rocket-powered descent stage lowering the one-ton Curiosity rover to the Mars surface. The best place to stand in the entire solar system at 1:14 a.m. ET Monday was about 150 million miles away, at the bottom of Gale Crater near the equator of the Red Planet. Looking west around mid-afternoon local time, a Martian bystander would have seen a rocket-powered alien spacecraft approach and then hover about 60 feet over the rock-strewn plain between the crater walls and the towering slopes of nearby Mount Sharp. A gangly vehicle, about the size of a small car on Earth, descended from the spacecraft on nylon cords amid blowing crimson dust. As soon as this machine touched the soil with its six wheels, its delivery craft abruptly disconnected the cables and, with the last of its fuel, safely careened away from its passenger. NASA's new Mars rover, Curiosity, had landed. With those words, the mission control team at the space agency's Jet Propulsion Laboratory in Pasadena, Calif., erupted in cheers, applause and hugs. And as the first pictures began to arrive from their nuclear-powered explorer, the celebrations grew louder and continued well into a televised news conference an hour later. "Needless to say there's a lot of excitement in this room," said the laboratory's director, Charles Elachi. When it comes to visitors like the $2.5-billion Curiosity rover, Mars has been a reclusive, get-off-of-my-lawn host. Of 13 previous attempts to land space probes on the Red Planet over the past four decades, nearly half failed or immediately lost contact. Those odds were enough to make for a tense scene at mission control in the days and hours leading up the landing. "You can't believe the tension and uncertainty here at JPL," NPR science correspondent Joe Palca reported from the laboratory. "The anxiety just couldn't be denied." 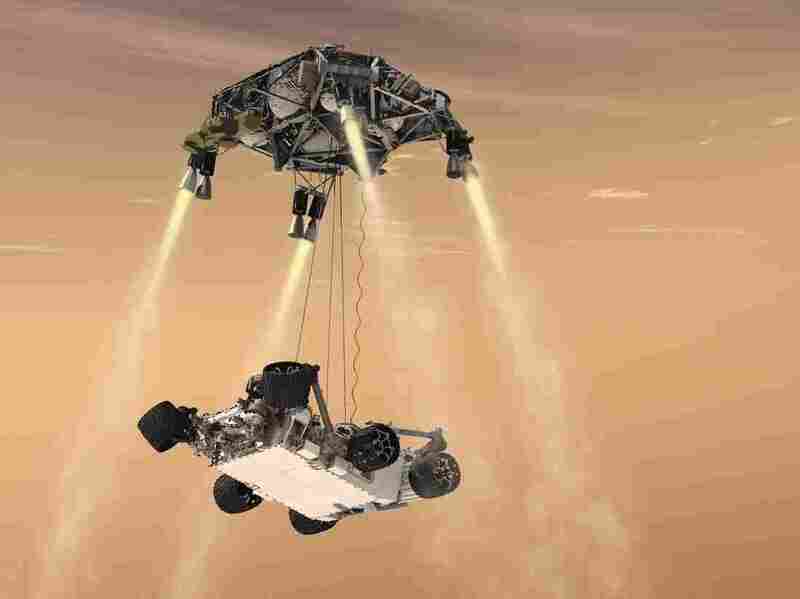 The novel use of the rocket-powered "sky crane" to lower the one-ton robot to the Martian surface only added to the drama. "I was on the edge of my seat," former astronaut and NASA Administrator Charlie Bolden Jr. told NASA TV moments after the landing. With the suspenseful landing behind them, mission controllers quickly turned their attention to Curiosity's coming months of work on the Martian surface. The rover is expected to spend two years exploring Gale Crater and the three-mile-high mountain within it. "Tomorrow," JPL's Elachi said, "we're going to start exploring Mars." NASA TV has been streaming video of the overnight events at the Jet Propulsion Laboratory and plans to carry the next scheduled news conference at Noon ET. Our earlier updates appear below. After a helpful space probe in Mars orbit again passed within range of Curiosity's transmissions, a new batch of photos arrived in Pasadena. In one of the black-and-white images, the shadowy rim of Gale Crater was clearly visible on the horizon. Mission control just got word that Curiosity successfully separated from the cruise stage that has carried the rover since its launch from the Cape Canaveral Air Force Station in Florida — 36 weeks and millions of miles ago. "A heat shield has to slow the spacecraft from 13,000 mph to about 800 mph. Then a giant supersonic parachute has to unfurl properly to slow the rover further to about 200 mph. Then onboard radar has to detect the surface, and rocket engines aboard a kind of jet pack have to fire, slowing Curiosity to a crawl. Finally, a bridle has to lower the rover from the jet pack to the surface." Easy enough, right? A NASA video calls the whole chain of events "seven minutes of terror." You'll find that video and a gallery of artist renderings depicting key moments in Curiosity's descent and landing in Joe's profile of one of the engineers behind this intricate plan. On Sunday's All Things Considered, Joe also talked with Richard Kornfeld, a senior engineer on the landing team, about the 14-minute delay before transmissions reach Earth. For people like Kornfeld, this has to make the Olympics coverage feel real-time. Update at 1 a.m. ET. The 'Bermuda Triangle' Of Space? Not that we want to jinx Curiosity, but it's worth a moment before the descent begins to go back through Mars' well-earned reputation as dangerous destination for space probes. We mentioned that 7 of the 13 previous attempts to reach the Martian surface were successful. The first, the Soviet Union's Mars 3 lander in 1971, arrived during a sandstorm and only sent back one partial, fuzzy image before communication was lost seconds later. Of the six failures, the landing vehicles crashed, lost contact on the way down or on the ground, missed Mars entirely, or never made it out of Earth orbit. The most recent losses were the European Space Agency's Beagle 2 in 2003 and the U.S. Polar Lander in 1999. The others were led by the Soviet Union or Russia. And the 2008 Phoenix lander, which confirmed the presence of water-ice beneath the arctic plains near the planet's north pole. Curiosity's destination is Gale Crater, where the six-wheeled rover is expected to spend at least two years looking for signs of water or possibly a long-gone lake. Samuel Kounaves, a chemistry professor at Tufts University, talked to NPR's Joe Palca and science writer Jessica Stoller-Conrad about the mission's scientific goals. The rover "is not going to be looking for life directly, but it's going to be looking for past habitability," Kounaves told them. "We're looking to see if the elements required for life are there." Gale Crater is nearly 100 miles across. Curiosity will try to land in a relatively flat area between the crater's rim and the steep slopes of Mount Sharp. The landing zone — 4 miles wide and 12 miles long — was narrowed recently to try to place Curiosity closer to the three-mile-high mountain, where scientists hope the rover will uncover layers of Martian history. Mount Sharp was named for Robert P. Sharp, an influential planetary geologist who died in 2004.